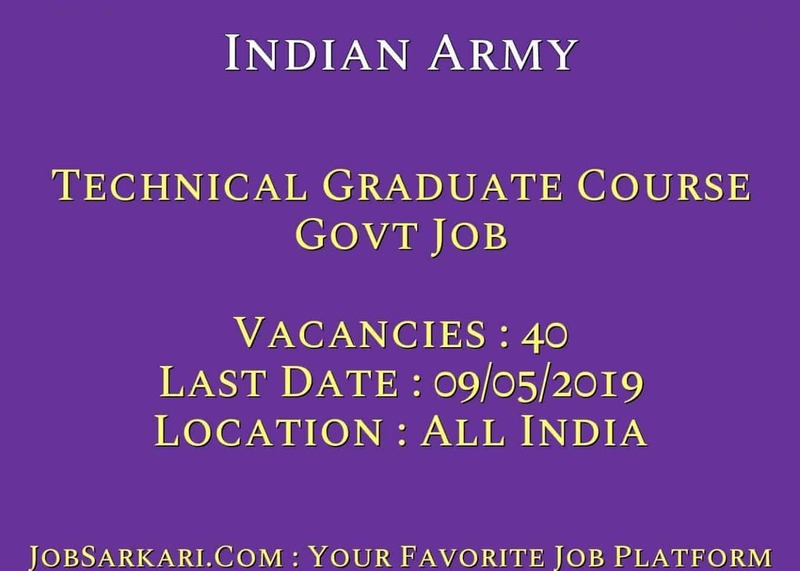 Indian Army Technical Graduate Course Govt Job 2019 Syllabus Check Here. Indian Army Notification is out. Indian Army is recruiting for 40 Technical Graduate Course Govt Job Posts. You can check Indian Army - Indian Army last date, download Indian Army notification, visit Indian Army official website and check other Indian Army Vacancy details.Complete Vacancy and recruitment Details about 40 Technical Graduate Course Govt Job vacancies in Indian Army are provided below by JobSarkari.Com only for you. Application Begin. 10/04/2019 At 12:00 Noon. Last Date of Apply Online. 09/05/2019 Up to 12:00 Noon. Civil. Candidate Must Have Passed BE/ B.Tech in Civil Engineering, Structural Engineering. 10. Architecture. Candidate Must Have Passed BE/ B.Tech in Architecture Engineering. 01. Mechanical. Candidate Must Have Passed BE/ B.Tech in Mechanical, Mechatronics, Mechanical And Automation Engineering. 06. Electrical/ Electrical and Electronics. Candidate Must Have Passed BE/ B.Tech in Electrical Engineering, Electrical Engineering (Electronics & Power), Power System Engineering, Electrical & Electronics Engineering. 06. Computer Technology/ InfoTech/ M. Sc Computer Sc. Candidate Must Have Passed BE/ B.Tech in Computer Engineering , Computer Science, Computer Science Engineering, Computer Science & Engineering , Information Science & Engineering. 08. Telecommunication/ Electronics & Comn/ Satellite Communication. Candidate Must Have Passed BE/ B.Tech in Electronics & Telecommunication Engineering , Telecommunication Engineering , Electronics & Communication Engineering , Electronics & Electrical Communication Engineering. 05. Electronics. Candidate Must Have Passed BE/ B.Tech in Power Electronics and Drives Engineering. 01. Metallurgical. Candidate Must Have Passed BE/ B.Tech in Metallurgical Engineering, Metallurgy & Material Technology, Metallurgy & Material Engineering, Metallurgy & Engineering & Material Science, Metallurgy and Explosives. 01. Instrumentation. Candidate Must Have Passed BE/ B.Tech in Applied Electronics & Instrumentation Engineering, Electronics & Instrumentation Engineering , Electronics & Instrumentation & Control Engineering , Instrumentation & Control Engineering , Instrumentation Technology. 01. Micro Electronics And Microwave. Not Specified. 01. 6. Candidate Have to Upload Photo And Signature As Prescribed Size And Format And Need to Save Data. 7. Please Remember and Save your Registration No And Password for Further References. 8. Online Applications Can Be Submitted On or Before 09th May 2019. Q. What is the Last Date For Indian Army Technical Graduate Course Govt Job Vacancy ? A. 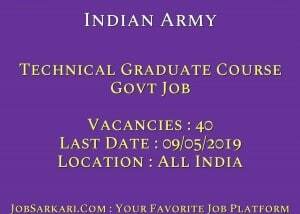 Last Date for Indian Army Technical Graduate Course Govt Job Posts is 09/05/2019. Q. What is the Form Type of Indian Army Technical Graduate Course Govt Job Recruitment ? A. The Form Type for Indian Army Technical Graduate Course Govt Job Posts is Online. Q. How many vacancies are available in Indian Army Technical Graduate Course Govt Job Posts ? A. There are about 40 Vacancies in Indian Army Technical Graduate Course Govt Job Posts.